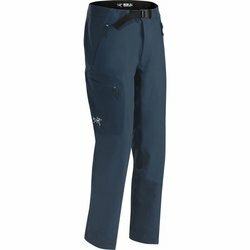 ARC'TERYX Gamma AR Pant. The Gamma AR is a highly versatile technical softshell pant designed for alpine, rock and ice. Made from Burly Double Weave, the Gamma AR delivers a high level of abrasion resistance and performance four way stretch with moderate warmth. The wind resistant fabric has a DWR finish to provide moisture protection and a brushed inner face for thermal comfort and improved wicking properties. The Arc'teryx Trim fit provides a low profile that layers easily under a hardshell. The gusseted crotch and built in articulation at the knees and seat combine with the fabric's four way stretch for exceptional freedom of movement. The cuffs are trim and adjust to reduce volume and improve visibility. The waist secures with a low profile integrated adjustable webbing belt and is lined with brushed polyester for comfort and moisture control under a harness or pack belt.